The Republic of Korea Air Force (ROKAF) received its first two F-35A Lightning II fifth-generation stealth fighters at a military air base in Cheong Ju, North Chungcheong province, on March 29, the service announced over the weekend. The two F-35As departed Luke Air Force Base in Arizona on March 22, where the ROKAF has officially taken delivery of six F-35As to date. 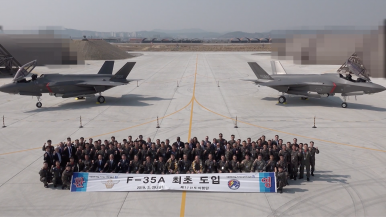 From 2017 onwards, ROKAF fighter pilots have been sent to the base to receive flight training on the F-35A. A South Korean F-35A pilot conducted his first F-35A solo mission there in July 2018. “We expect the deployment of the stealth fighters [to] enhance the Air Force’s operational capabilities by strengthening military readiness posture against possible threats from all fronts,” Defense Acquisition Program Administration (DAPA) chief Wang Jung-hong was quoted as saying by The Korean Times. The F-35A’s manufacturer, U.S. defense contractor Lockheed Martin, won the $7 billion contract by offering 25 technologies used on the F-35A to support South Korea’s indigenous $15 billion KF-X fighter program. However, the U.S. government did not share four key F-35A technologies including active electronically scanned radar, the infrared search-and-rescue systems, the electro-optical targeting pod and the radio frequency jammer, which detrimentally affected bilateral defense relations for a while. All 40 F-35As will be assembled at a Lockheed Martin production facility in Fort Worth, Texas, where the first ROKAF F-35A was rolled out in March 2018. South Korea is also in talks for an additional order of 20 F-35As with DAPA reportedly already having initiated their procurement. Another U.S. regional ally, Japan, officially stood up its first F-35A squadron on March 29. The new squadron, consisting of 12 aircraft, swapped its McDonnell Douglas-Mitsubishi F-4EJ-Kai Phantom II aircraft for the F-35A last month. The unit is based at Misawa Air Base in the northern part of Honshu island. Japan selected the F-35A as the Japan Air Self Defense Force’s next-generation fighter aircraft in December 2011 and placed an order with Lockheed Martin for 42 fifth-generation fighter jets. In December 2018, the cabinet of Japanese Prime Minister Shinzo Abe decided to increase Japan’s existing order of 42 to 147 F-35 aircraft including an additional 63 F-35As and 42 F-35Bs, the short take-off and vertical landing (STOVL) variant of the aircraft.